Folks were surprised recently when their neighborhood Albertson’s became a Haggen market and the local Radio Shack started morphing into a Sprint store, but that’s nothing compared to the epochal transformation happening to Los Angeles – especially for those that love those distinctive unusual joints that make the fabric of the city so special. The Los Angeles Conservancy and historic preservationists have bigger fish to fry. Most of these are not designated landmark buildings and most of them are not as well known as the handful of buildings that get saved each year but they play a big part in the unique culture of Southern California. Major change is upon us in 2015 as new topples old and local favorites disappear. Summer isn’t even over and these classic places are heading for extreme remodels, complete demolition, or have already passed into history. Goodbye special places, hello blandness. 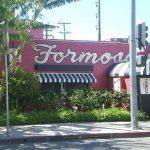 This 90-year-old restaurant enjoys city landmark status, which protects the building, but not the ancient booths, lanterns, and funk inside that made this a favorite of film location scouts (remember it in L.A. Confidential?) and fans of old Hollywood noir. A remodeling in July stripped the interior and replaced it with less. Well, it made it to drinking age. The massive nightclub opened in 1994 with opening acts that included Etta James, Little Richard, Isaac Hayes, James Brown, and co-owner Dan Aykroyd’s Blues Brothers. Staff tells me after they close on August 7, the elaborate interiors and corrugated metal exterior (from a Clarksdale, MI cotton mill) will go into storage as the club looks for a new location. The site will be redeveloped into a mixed-use condo, hotel and retail project. Another 1950s bowling alley goes under the knife to emerge as a luxury bowling center. There wasn’t too much left at this one outside of the amazing mosaic mural outside (which I’m assured will stay) and the vintage terrazzo and flagstone coffee shop KJ’s which will disappear with the remodel. The family behind MB Post, Fishing with Dynamite, and the venerable Mimi’s Café chain began their empire with the French Quarter restaurant in 1973. 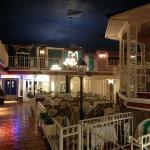 The restaurant was tucked into a theme park-style atmospheric New Orleans neighborhood built inside an art deco-era supermarket. 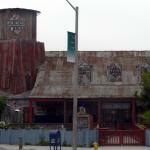 The over-the-top environment attracted tenants like Baby Jane, a movie memorabilia shop that stocked autographs, costumes, and “celebrity earthquake ruins.” The restaurant closed in July and has not announced plans to reopen. The first time this venerable address showed up in the newspaper was when a drunken actress crashed her car into it in 1958. A parade of colorful customers wafted through for decades until the diner-style restaurant closed to make room for a Chipotle. 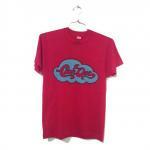 The same owner runs Astro in Silver Lake, which benefited from a minor makeover when Jan’s closed. Home Savings of America spent big money for decades on custom artwork for each of their bank locations throughout California. When they built a new headquarters in 1989 they assembled a team of artists to fill the building with sculpture, murals, and other now-endangered works. A 360° painting called Latitude 34, Longitude 118, A Southern California Panorama fills the 6th floor “sky lobby” and is especially threatened as new owners remodel the tower. Time machine splendor located outside of our normal service area, but close enough to Disneyland that it still counts. Architect Martin Stern, Jr. designed this restaurant and shopping center in high modern style in 1955 before he became famous for Ship’s, the Beverly Hills Public Library, and half of Las Vegas. Otto and Antje Hasselbarth took over the place in 1972 and didn’t change a thing. The restaurant was closed for summer vacation when Mr. Hasselbarth passed away on July 15. It remains closed and it’s future is uncertain. 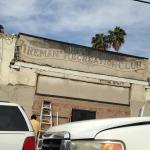 This century-old “recreation club” for firemen in East L.A. (I’m told it once housed stables) was converted to apartments generations ago. The amazing hand-painted sign survived hidden only to return for a moment and then get painted out as part of an apartment remodel. 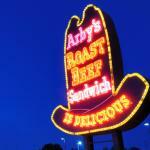 Arby’s Roast Beef vacated their Van Nuys store after 30 years (it was a Roy Rogers Roast Beef before that) and the site is now a Starbucks, but the iconic cowboy hat neon sign lives on at the Valley Relics museum in Chatsworth. When the Santa Monica location closed last year, a similar sign was donated to the American Sign Museum in Cincinnati, Ohio. This 1970s restaurant with an English taxicab and red phone booth outside is a big, dark fussy labyrinth of olde-tyme, Anglophile folderol of the kind that is nearly extinct in today’s minimalist restaurant interiors. Go have a final prime rib before August 8th, when it closes to be replaced with 201 apartments. 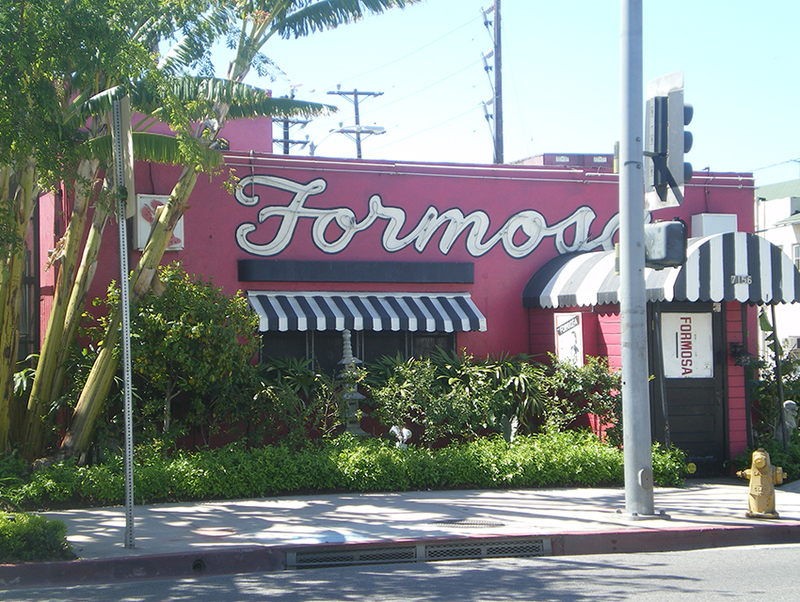 This 67-year-old restaurant was filled with sassy old waitresses and black-and-white pictures of Glendale. Everything in that place, from the patrons to some of the items in the deli, seemed to be original. Jewel Thais-Williams has a history degree from UCLA and a traditional Chinese medicine degree from Samra University. She runs a free clinic, a recovery house, and a vegan restaurant. She worked with Hillary Clinton in the early days of AIDS, and serves on the board of endless non-profits…and she runs a dance hall on Pico Boulevard. Her Catch One nightclub opened in 1972, and the ONE Archives at the USC library describes her club as the “Nations’ first black gay and lesbian disco.” Jewel’s last dance was July 18. 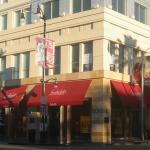 The venerable lingerie shop, that once had celebrity brassieres on display at its Hollywood Boulevard flagship and museum, went out with a whimper in April. The chain closed all 94 stores, including #1 at Hollywood and McCadden when it was purchased by a New York holding company with a very unusual history. 100-year-old Charles Aidikoff has spent nearly half his life running a private luxury screening room for filmmakers on Rodeo Drive. A dispute between the invitation-only theater and its landlord led to its closure this week. 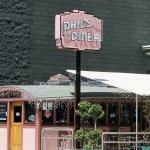 The term “diner” gets thrown around a lot, but the only real-life prefabricated dining car diner in L.A. was Phil’s in North Hollywood. In 2008 the city redevelopment agency relocated the decrepit restaurant and it was restored and running beautifully again as Phil’s Diner 2.0 until the operator closed it down after less than a year. The place sat empty for years until a St. Louis barbecue chain moved recently and replaced the neon sign (an exact replica of the stolen original) with their cartoon baby logo. The cheaper and weirder cousin to glamour spots like the Biltmore or the Hollywood Roosevelt, this 1920s Spanish style hotel with a 1990s Moroccan overlay feels a little like discovering a secret bazaar filled with dusty carpets and tapestries and hanging lamps. The Trip Advisor reviews are all over the place, ranging from “Grand dame” to “lipstick on a pig.” A $30 million renovation beginning next month will certainly bring it more in line with a fancified South Park but will tame its flamboyant soul. 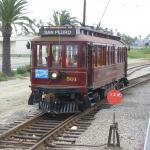 Three restored and replica turn-of-the-20th century Pacific Electric red cars clanged their way along the shore in San Pedro for the past 12 years. They are scheduled to go into deep freeze when Sampson Avenue is realigned (without tracks) later this year. This was one of the first fancy vintage style shops to revitalize South Pasadena when it opened in 1975. The old-time neighborhood candy, gift, and toy store in a charming little bungalow is empty and rumored to become a wine bar.